Debi mentioned in a comment that she wasn't sure she liked the selling part. 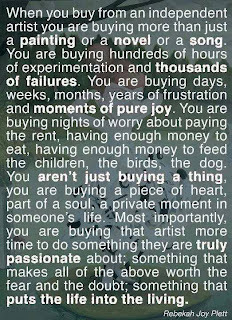 Well, I don't much like it either but I learned a long time ago that until the product is sold, the job isn't finished. Doesn't make a bit of difference if you are building the very best mousetrap in the universe if no one knows you're doing it or how to get to you to purchase it. So I've learned to grit my teeth and do the marketing part of the job. As part of that, from time to time I offer package specials. With the holiday week coming up including three very important birthdays (well, I'm stretching the definition of week a bit!) I'm once again offering a very special deal. July 1 through 7, purchase all three of the A Good Yarn titles - Cotton; Rayon; Linen and Hemp - and receive for free a flash drive with the pdf version of Magic in the Water. Price for this package is $220.00 Canadian including shipping within North America and $250.00 Canadian outside of North America (with North America defined as Canada and the United States). Since I'm leaving July 8 for Boston and NEWS, I am not extending the offer through my own birthday as I usually do. Happy Birthday Canada, the United States and.....moi. Payment may be sent via Paypal to laura at laurafry dot com or email me and I'll send an invoice, letting me know your location. VISA/Mastercard charges will be billed in Canadian dollars and the exchange rate (if you are outside of Canada) done on your monthly statement. Send your phone number and I can call you for your credit card number if you prefer that payment option. When things are going smoothly and only surface attention is required for the actual weaving the thought squirrels sometimes start chasing themselves around in my head. This morning's squirrel had to do with DVD's, teaching 'remotely', and the various efforts I have made to satisfy the desire to learn when people can't attend workshops for one reason or another. To that end I produced (with the help of my web guru) a CD with text, numerous photos and embedded video clips showing the action where I thought it necessary for people to really understand the motions. It took a great deal of effort to keep the CD format up to date with computer technology PLUS people kept getting confused, thinking that what I'd done was a DVD. Eventually it just became too much and I discontinued production of CDWeaver, loading most of the clips produced for the CD onto You Tube. But the requests for a DVD keep coming. Well, folks, I don't know how Victorian Video and/or Interweave choose their subjects. I do know that there must be a dozen videos/DVD's with warping info on them. Back-to-front, Front-to-back, Scandinavian style, North American style, tips and tricks galore. There is no dearth of warping information. Just finished Dancing with the Virgins by Stephen Booth and started The Perfect Ghost by Linda Barnes. It's not one of her Boston based Carlotta Carlyle mysteries but I'm happy to see a new title from her after several years. It may have been Thomas Edison who is credited with the saying that creativity is 1% inspiration, 99% perspiration. I'm at that stage now where it is eat-the-elephant. 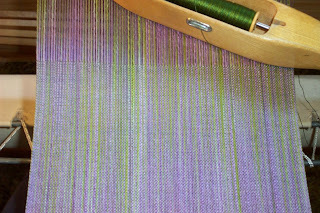 Once scarf, one warp, working up the perspiration in order to get as many of the painted warps woven as I possibly can before the end of August. Because the job isn't done at the weaving part - they still have to be fringe twisted and wet finished, then trimmed and tagged before they are really and truly ready for sale. 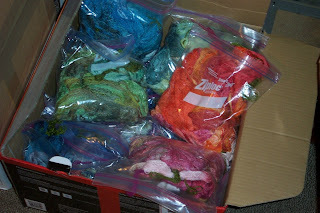 But I have my box of weft yarns now and the dyer is going to try to dye some 2/16 rayon in colours that I can't get from Silk City so I'm keeping fingers crossed that the yarn isn't too tender and that it will wind off of the dye skein without breaking. I have sort of lost count but I do believe that the warp going into the loom tonight is #18, that I have so far woven 68 scarves. There are going to be 47 warps in all (if my count is accurate!) for a grand total of 188 scarves. I joined Face Book at the urging of a friend so that I could see her photos. Since then I have experienced the full Face Book gamut of political satire, cute kitty pictures, silly jokes and the occasional brilliant bit of philosophy. This morning the above poster appeared. I was going to just share it on Face Book, but did a bit of digging to see if I could locate the author. Turns out she's Canadian (Vancouver) and sells the poster on Etsy. Since I had a bit of money in my Paypal account, I went ahead and purchased the poster and asked permission to share it here on my blog. I'm thinking of displaying it in my booth as a part answer to the question "How long did it take to make (insert noun)." Repeat a class?? Most definitely…especially one like Laura’s Weaving Boot Camp. 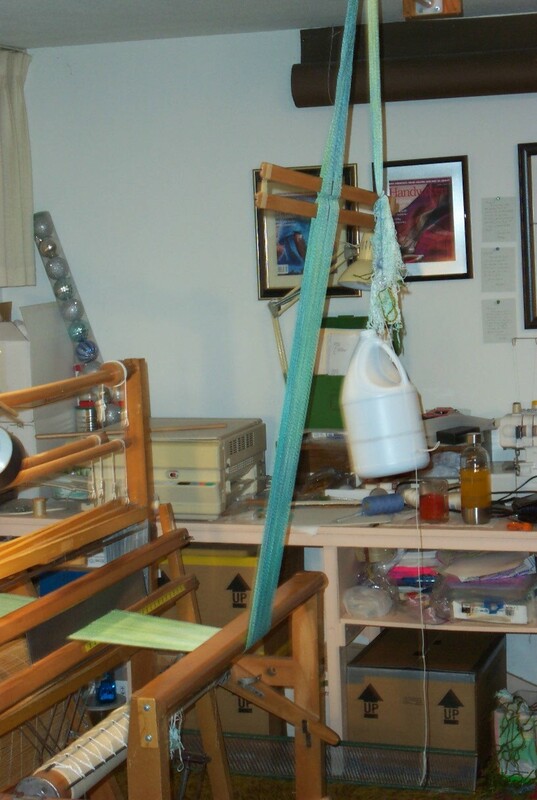 Five years ago I was a brand spanking new weaver who bought a loom and literally didn’t know which end the yarn went on. Boy was I surprised to find it went on both ends. I spent a couple of very frustrating and disaster ridden years trying to teach myself to weave. I came to realize that I needed to have a good foundation of the basics before I could ever hope to weave any of the things I wanted. So, in 2012 I took my first formal weaving class at John C Campbell with Laura Fry. Laura taught me the basics and much, much more. 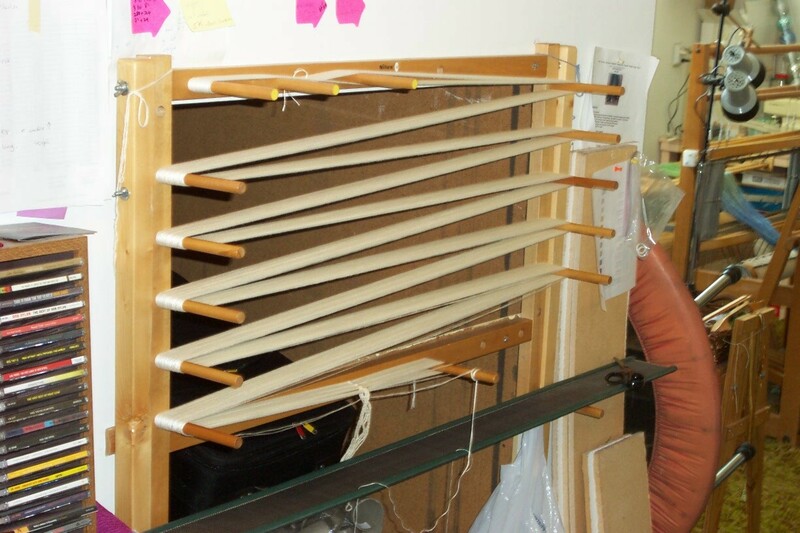 By the end of the week I could get a warp on the loom and ready to throw a shuttle in what seemed like record time to me. I knew how to throw a shuttle properly, that not all projects are beat like a rug and to quit fiddling with the selvedges. Learning to do all of those things efficiently and ergonomically reduced the aching back and shoulders. That was icing on the cake. I spent the next year practicing and improving the skills she had taught me. This picture is what I would call the ‘Scarf of Learning’. It was my first project from the first class. Those are not shadows in the picture on top, the scarf is lying flat. The fabric is upholstery density, strong enough to withstand 3 German Shepard dogs. Not really what you want for a scarf. 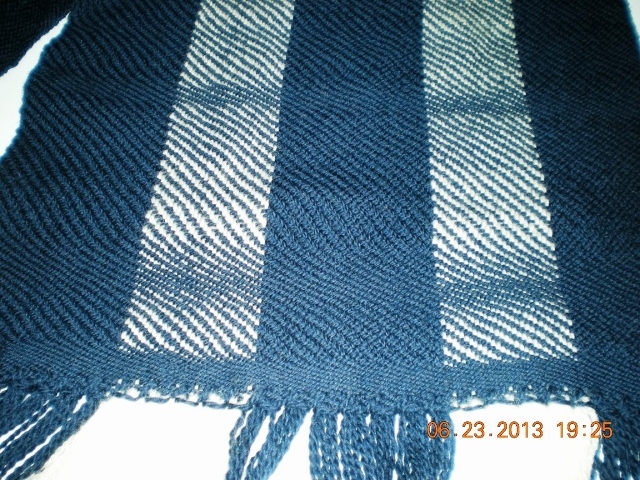 The picture on the bottom is the end of the scarf after learning some of those basics I needed. I had such a great experience that I signed up for her class again in January 2013, armed with a higher set of goals. Laura helped me reach those new goals and I also discovered an interesting benefit to taking that ‘repeat’ class. I discovered that there were a lot of things that she lectured on and demonstrated the first year that didn’t make it to the 'save' file in my brain. In that repeat class I was able to understand the next step and fill in the gaps needed to improve my weaving skills even more. I think I learned twice as much the second year. The Army taught me that learning is done in layers; you start with the basic knowledge and just keep building on that. Laura explains it as ‘filling in the cracks in the foundation’ and I can’t think of a better way to describe it. Without the foundation of knowledge it’s hard to even understand the next layer of complexity. Once those basic skills are set it seems the possibilities are endless and doable. Taking the class the second year with the same instructor and in the same weaving studio meant I knew what to expect from both. I was able to start out the first day concentrating on learning. It also meant that Laura was familiar and comfortable with how I learn best and could point me in the right direction immediately. 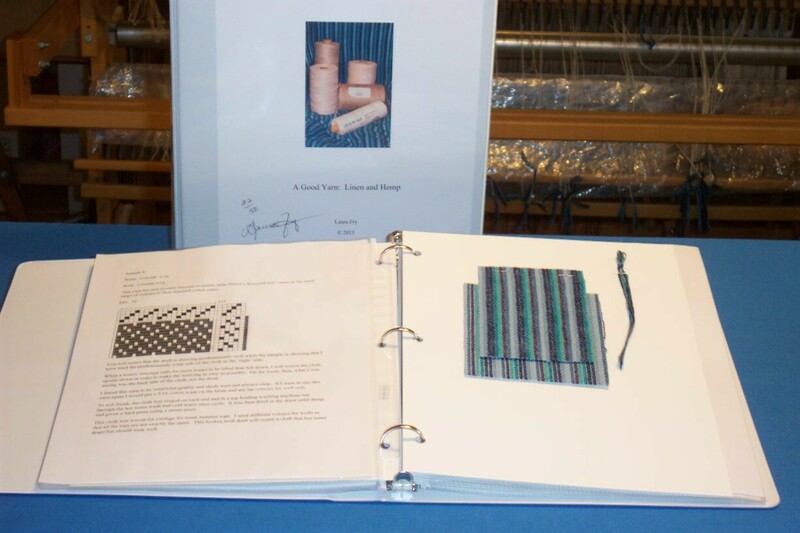 My weaving projects have come a long way since then. I plan to attend the class in January 2014 and have already started thinking about what goals I want to set and questions I want to ask. It took me a long time to get into gear today - even with 3 cups of high octane coffee. The conference had been pretty intense, the worry over the flooding in Alberta affecting my friends (and not to put too fine a point on it, selfishly, sales at Fibre Week in Olds) and the long drive there and back. Add to the mix too many allergens and too little 'safe' food and it's not much wonder I arrived home exhausted. However, I did finally manage to pull myself together, deal with mail, banking and picking up my new (perfect, this time!) care tags, came home and unpacked the 12 painted warps I picked up from the dyer on the way home. 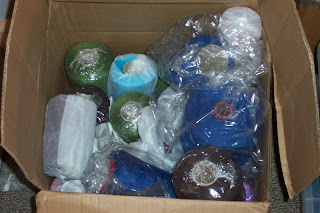 The order from Silk City with the Bambu 12 should arrive any day, plus with the fine yarns I bought at the conference I will have plenty of weft to carry on with weaving these scarves. I still haven't even opened my big suitcase. There are three seminar topics worth of samples in it, which have to be unpacked, sorted and then the appropriate samples for the two topics at NEWS packed up. I leave again in 13 days, which sounds like a lot except for all the medical stuff that has to be done between then and now, the dye day with 3(!) new guild members dying to learn how to dye, etc., etc. But a 'light' day was necessary today so that I can jump back into the fray tomorrow. For now I think a little loom therapy is in order. Seems like I've been away from the loom for longer than 5 days! This year marked the 25th ANWG conference. Weavers from all over the Pacific Northwest and western Canada have regularly gathered to celebrate textiles. Long before the internet, weavers, spinners and dyers had to communicate via mail or in person at such gatherings as regional conferences like ANWG. Mid-West. MAFA, and so on. While the internet has 'shrunk' the world and allowed us to be in close contact with other like minded individuals all round the world, there is nothing quite like meeting in person, being able to shop in actual physical 'stores' and, best of all, touch the textiles that others are creating. I was delighted to see that my friend Betty Bell had won a People's Choice award for her lovely cotton napkins with supplemental warp and weft borders. 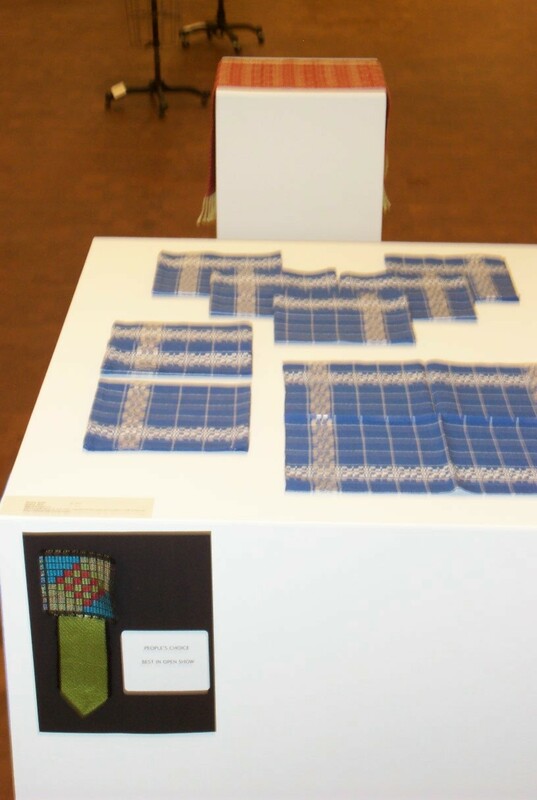 Unfortunately the photo is a bit out of focus - I was trying to include the award 'ribbon' as well as the lovely display in the exhibit. There were instructors from round the world - Bolivia (yes I managed a short chat with Laverne Waddington), Australia (ditto Kay Faulkner), the east and south (Darryl Lancaster, Liz Walker, Marg Coe, Bobbie Irwin - and more I didn't get a chance to visit with) and of course, all round the ANWG region. Attendees came from the eastern seaboard, California, Minnesota, beyond. The campus was interesting architecturally, Cindy White had initiated a 'storm' of yarn type landmarks helping to identify the buildings with classes, and so on, and the rain even let up for a few days. They don't call it the 'wet' coast for nothing! I have lost count of the number of ANWG conferences I have attended, but it has been quite a few of the 25 (held every second year). I am looking forward to the next one, and meeting 'old' and new friends again, in person, in two years. With a 'free' time slot this afternoon I also managed to get into the exhibit hall. So often I am just too tightly booked with no time to do that. So I really enjoyed the opportunity to get into the exhibits. The fashion show garments were in the same gallery and having a handling piece meant I could satisfy my need to fondle, er, touch the textiles. It has been great to sit and talk with other weavers and share out joy in creating textiles, see hand made textiles being worn and not have to explain why you have to be warped to weave! But it is almost time to begin the journey homewards. Back to the loom. And my own bed! Not sure how Doug will get home as there are road closures in many places, although road crews are working hard to fix them. Makes the sun here all the more welcome! Tomorrow is looking at lace, and if my voice gives out entirely, it may be a short presentation. Of course I did not bring throat lozenges, it not being winter, I didn't think I'd need them. Should have known better! Arrived last night at 7:05, too late to register, late to drop my shawl off, just late for everything. Did get my housing sorted, dropped of the shawl (better late than never?) took a peek in at some of the workshops then crashed in my room. Could not figure out the wifi, but got that straightened out this morning. Managed to visit for a few minutes with Bobbie Irwin and got to see her samples of iridescence :). One of the joys of attending conferences. Marketplace opens this afternoon, along with guild booth displays. Must get back to the exhibits. Was too tired last night to walk round the gallery, especially with no parking permit, so I needed to trek all the way back and move it to a 'legal' space. Got that cleared up and no worries about parking. Remembered to bring my camera so will try to remember to take some photos. Scrambling to get everything done that needs be done before I leave. I'm pleased that I have managed to finish the last warp, dress the loom with the next (#16), wound 3 warps for painting (with only one slight oopsie) because the yarn did indeed arrive today. Still have to finish packing my clothing and personal stuff but the big suitcase is already in the truck, Tom-Tom is programmed for the two stops, and I need to go continue warp winding. 'See' y'all when I get back! 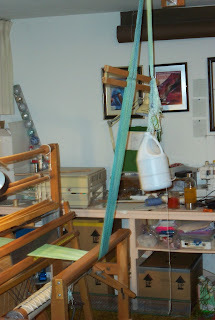 Getting to this point of completion for A Good Yarn: Linen and Hemp meant that progress on the painted warps stalled. 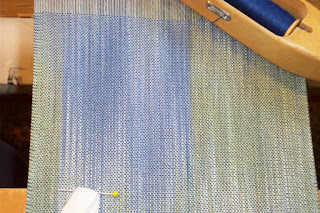 While I did manage to weave at least a little bit each day, I didn't have much energy left over, especially after the marathon assembly/shipping days. Then I was busy all day Saturday with the World Wide Knit in Public Day (no photos - forgot about taking some) and today was Lace Day - where I actually made a little progress on my next bookmark. 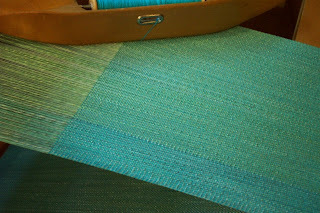 Not enough woven yet to see, but I'll take a photo and post when there is. 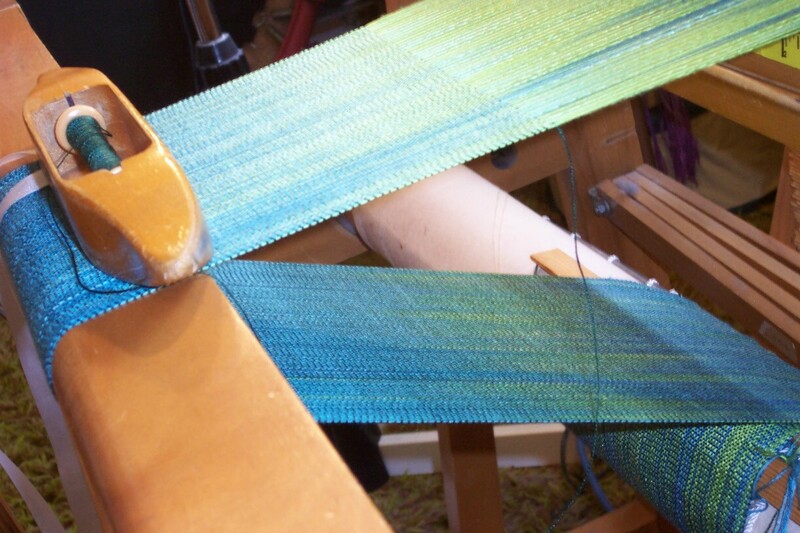 This is the last of the blue/green warps and I'm hoping to complete it and leave the loom with the next warp set up ready to go so I can jump on the loom when I get back from Bellingham. 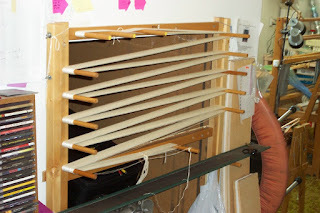 I will be picking up another dozen warps from the dyer on the way home and frankly, with my schedule the way it is...so far...I don't have a moment to waste. It could get a whole lot busier after my meeting with the project manager (if that's the correct term) in Bellingham next week. It just now occurred to me that from the time I get home late Sunday June 23 until the time I leave on Monday July 8 is just - gasp - 14 days. At any rate, now that the dust has settled from getting A Good Yarn: Linen and Hemp done (everything that is except the marketing and selling/shipping) I find myself drained of the enthusiasm to do another. While I had planned on a fourth in the series, on Silk, my schedule is so full I could not possibly even begin to think about it until December. Perhaps by then I will be ready to take another run at doing it all over again. Part of the lack of enthusiasm is the cost involved, not just our labour, the yarn, the actual hard copy, but the shipping. It seems as though it is getting harder and harder for small businesses to do mail order and it is impossible for me to cross the border in person to sell stuff at conferences in the US. Which is why I have been looking a lot more closely at on-line options, for all the negatives involved in digital produced publications, they do have their attractions. I guess what I'm saying is that if you are interested in seeing more actual hard copy books in print, spread the word. 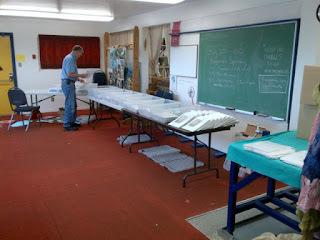 Not just about my publications, but all weaving (and spinning/felting) publications. Don't assume that everyone knows about these things. 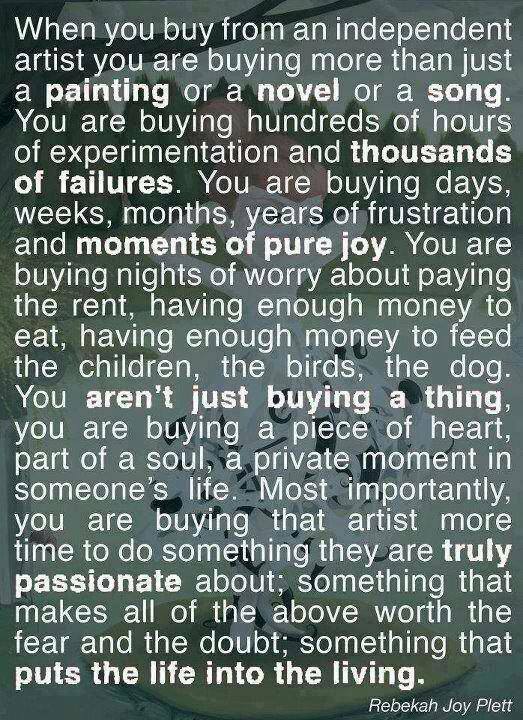 People like myself do not have the advertising/marketing budgets to make sure the entire fibre arts community knows. And if publishers, whatever size they may be, can't sell their print runs, there will be fewer and fewer of them around. However, I have over the past few years, been feeling more and more guilty about the number of plastic bottles of pop or soda I buy. It's been niggling at the back of my mind but I just can't seem to 'enjoy' a plain glass of cold water in quite the same way as I do a carbonated drink. For the past 5 years I have been mostly drinking a beverage I buy at Costco called "Ice", which is sweetened with sucrolose. I read that article a few minutes after paging through a sale flyer, something I almost never do. 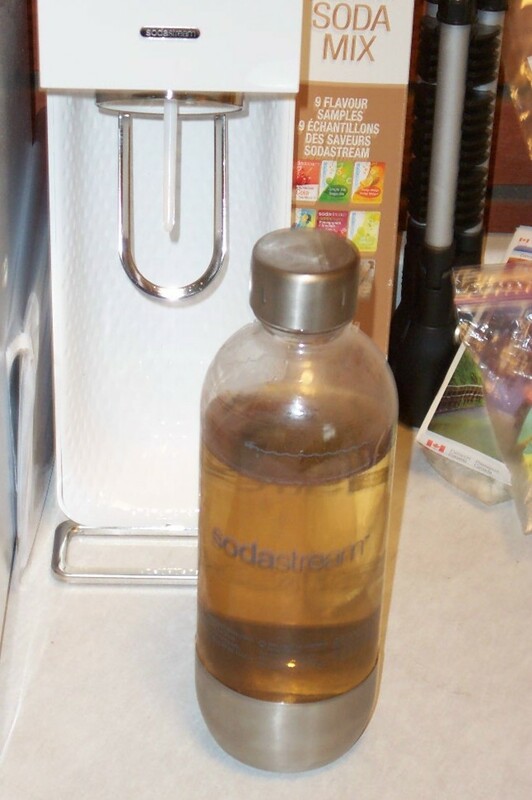 My eye fell on an appliance called Sodastream. An at-home carbonated beverage maker. This morning I went to the store, read through the tiny bit of information on the box, saw the options for making flavoured drinks - all of them sweetened with sucrolose - noticed that they also had unsweetened flavours, added up how much it would cost per liter to make drinks at home - and look - no plastic bottles! - and bought one. Yes, it has a plastic bottle for actually making the beverage, but it is reusable. As for the sample packs of artificially flavoured sweetened packets that came with it? I will use them, but will probably switch to the unsweetened flavours, or better yet, make my own flavoured syrups. Fruit season is coming soon, isn't it? Otherwise today has not been a particularly productive day. I have 'lost' the binder for the lace workshop and after looking high and low for it, finally emailed one of the students from the workshop in March who has kindly agreed to photocopy the binder and give the copies to Doug in Alberta. Of course you know what that means, don't you? I will find the binder when I get home. Went to pick up the new custom printed care tags this morning. You know, the ones where I spent a lot of money on a really nice paper? Where I'd brought in a sample of how they should look, including the hole drilled at the top so I could attach them to my scarves? My expensive scarves? Where I wanted a tag that would reflect the value I placed upon my product and to help justify my price? Where I had made a serious point to the gal at the counter about how that hole had to be far enough away from the edge of the paper so that it wouldn't break? Because the cheap ones I bought from Staples hadn't been far enough away? As I was waiting for the gal at the counter to get my invoice ready, I opened the box because they had not, as had the previous printers done, attached one of the tags to the outside of the box. "I'm sorry" I said. "I cannot accept these." There was suddenly stunned silence in the room. "Look at the hole. It's far too close to the edge of the paper. It's going to break and look terrible." "So I'm sorry, I cannot accept these." Rustle, rustle as the gal opened the file and found the sample I'd left. "You see how much room there is on this (sample) tag? I need at least that much space or the paper will break and the tag will fall off." "So I can't accept these." At which point another gal came over, looked at the tag, too, and said "Oh." And then said "I see. Well, we will have to re-do them." "Can you use any of these?" "Well, how soon do you need them?" "I'm going away and don't need them until I get back. I'll phone when I'm home again." "Right, I'll phone when I get home, then." No. Just, no. One little word. So powerful. Most authors write their books, edit them and then hand the next step in the process over to a band of experts. Not me. Nuh-uh. No, I have to do publications with actual fabric samples. 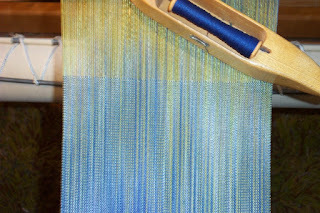 So instead of just writing, I'm weaving (and not just one for pretty pictures, but enough for each copy), which opens up a whole other set of tasks. Like wet finishing, cutting, stapling. Then, there is the assembly. Fortunately the guild has a fairly large room with lots of tables so we lugged everything (and by we I mean Doug) up the long set of stairs. After picking up the text pages we (and I do mean we, this time) inserted the pages into plastic pocket pages. 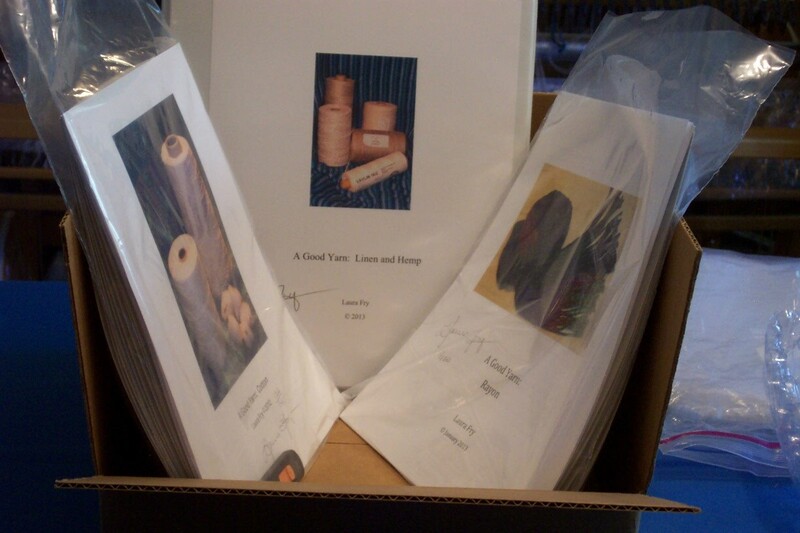 Once that was done, the text pages and sample pages had to be collated and everything put into ring binders. 9 'man' hours, give or take, just to get everything put together in a nice (I hope) attractive package. But, it's done. Now I'm thinking about the wisdom of just doing eBooks - a whole lot less work, really....and I'm sure our backs would really appreciate not having to stand for 4 or 5 hours shuffling paper. My tight deadlines are not my suppliers' problem. Sending the incorrect yarn, is. I don't like leaving a partially wound warp on the warping board but in this case I really don't have any choice. At 8" the warp is just way too narrow to consider a 'fudge' so it isn't worth my while to tie it off and have it dyed. It won't 'fit' the rest of the production run closely enough. So while I wait until noon when I can pick up the copies, I have been doing other things. Like running back to Costco for a small tweak of my frames. Dressing the loom with another warp. Discussing with Doug what needs to be done over the next few days so that we can actually get the publication assembled and packed up, ready for the conference in Alberta next week. Not to mention the orders mailed before we leave. My suitcase is still empty, too, and if the yarn actually does arrive on Friday, I will have Friday night, Saturday night (because I'm hosting a Knit in Public day at the Railway Museum), Sunday morning and evening and whatever I can squeeze out of Monday, in between everything else that needs doing. So today has not been a great day, although not horrible. Up at 6 am to make a 7:30 am dental appointment - I think my mouth may still be a little bit frozen in this photo? Scrambling all day, final edits of AGY: Linen and Hemp (contact me if you have not received an email with details of purchasing) - oops - forgot about shipping boxes, dash to the office supply place to order 50. Over to Staples to drop files off. 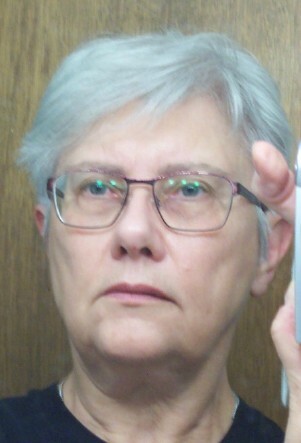 Anyhoo - new glasses = new Rx = disorientation in the middle distance. Y'know - the distance needed to throw and catch the shuttle? So I haven't actually tackled the loom yet. But I will. Soon as I finish this blog post. Because it's the only way to get used to the new eyes, after all. And oh my, yes, I really am....63. Or will be in four weeks.... Yay? about as good as I can get it. Hard to get good photos of cloth and yarn! Yesterday I roared through the warp, wove scarf #48 with the 2/16 bamboo, fringe twisted it and got it (along with a batch of other scarves in approximately the same colours) run through the washer and dryer. 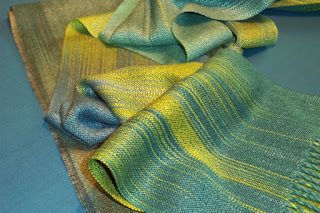 Today while I was up at the guild room hoping to sell some yarn Doug pressed all the scarves and the two shawls I'd wet finished so I could compare the latest 'sample' to the rest of the scarves woven with different yarn for weft. 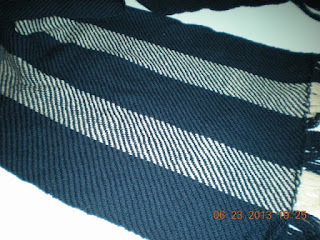 The scarf with the 2/16 yarn is very slightly lighter (thinner) than the 2/10 Tencel (no surprise there). But, and it's a big but, the drape is so close in quality to the Tencel that I have no qualms about going ahead with this alternate yarn for weft. This is a huge relief because I truly did not want the added expense (labour and outright cost) of having to get some fine rayon custom dyed. That would have pushed the 'profit' margin to such a thin slice that it would truly not have been worth my while to even make them. As it is I'm having to increase the price of my scarves. Truth to tell, my prices have been static for the past several years as I have battled with health issues - issues that have taken the focus off my business. Frankly, I have just been coasting, in more ways than one. It is well past time that I look closely at all the facets of my life/business and some changes were long overdue. My prices are one large one. Costs of everything else have continued to climb while I have been dealing with Life. To partly compensate for the higher price, these scarves are longer than the ones I had previously been making. The longer length will help to justify the higher price, necessary because of higher material costs, marketing costs, etc., etc. Sometimes you just have to have faith in your product and yourself. If you don't value yourself, why should anyone else? Working with that 8 ounce skein of 2/20 Tencel I was forcibly reminded why I loathe working with skeins of fine yarns. The yarn broke, repeatedly, until finally the loose end buried itself so deeply into the skein that I could not find one, let alone either of them. 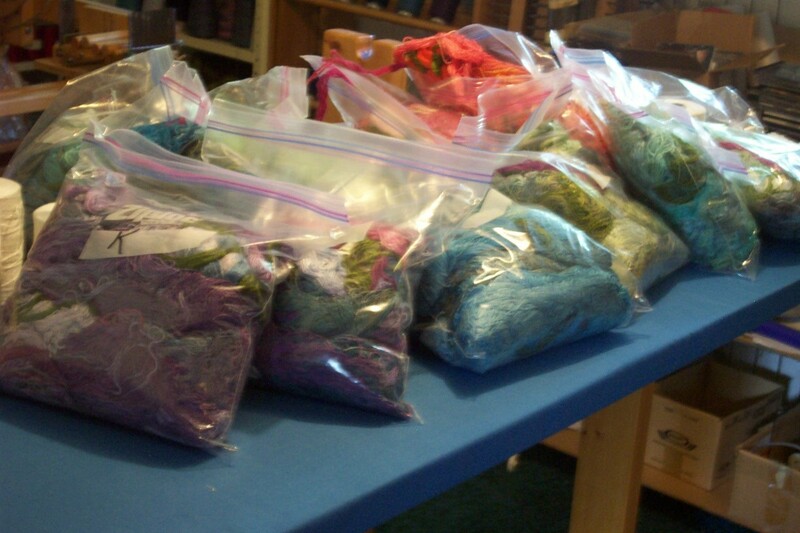 In the end I wound up throwing away nearly half of the skein. 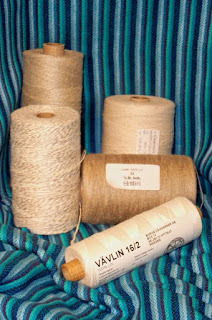 Which realization sent me on a quest for some other fine yarn that was commercially dyed and came on tubes or cones. And so scarf 47 became another full-sized sample. In order to quickly identify it from all the other scarves in the run I inserted a small loop of yarn and as soon as these scarves are cut off the loom I will, as a matter of priority, fringe twist and wet finish it to see if the 2/16 bamboo yarn from Brassard will be okay. I don't expect it to have the same hand as the Bambu 12 - it is spun with a much higher degree of twist making it stiffer - and stronger - than the Bambu 12. But it might be in the same category as the 2/10 Tencel in terms of hand. If so, I can switch to it instead of buying a fine white yarn, skeining it off, getting it custom dyed and then struggle to get it off of the skein onto bobbins or cone. The savings in labour alone are worth it if it will make a reasonable substitute for the Tencel. Weaving, like life, is accomplished in the same way as one eats the proverbial elephant - one bit(e) at a time. To tackle a big writing project (Magic in the Water), set out to achieve the Master certificate (Guild of Canadian Weavers), or even to just get sufficient inventory ready for the upcoming show season - all seems so simple. When one encapsulates the 'big' project in a short sentence, it is easy to forget that getting to that point may take several months, perhaps even years, to see the thing actually finished. So while I can say with a certain sense of satisfaction that AGY: L&H is 'done', it is only a certain value of doneness. 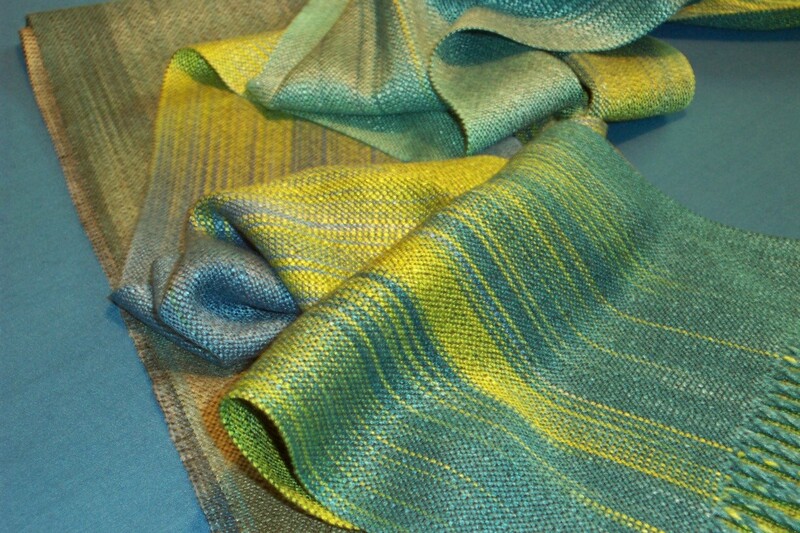 Yes, the samples are woven. Yes, the bulk of the text has been set down. BUT! Write the files to a cd and deliver to Staples. Buy the binders and plastic pocket pages. Pick up the box of paper from Staples. Insert text pages into plastic pocket pages. Insert cover into binder 'cover'. And then I'm still not done because the orders (assuming there are any) have to be processed, the binders packaged up and then everything taken to the post office for mailing. If I consciously thought about all that before I came up with the thought "I think I'll design and weave samples, write a publication about fibre characteristics and sell them" I'd probably come to a dead stop before that thought even finished forming. But the optimist in me sees that reality in the corner of her eye and blithely goes ahead, anyway. And with a pretty much blank teaching schedule for next year, on top of everything else I have agreed to sit on not one, but two volunteer boards. Someone want to give me a smack upside the head? Yesterday I talked about having to be flexible and go with my #2 choice of yarns. Last night I rummaged through the dwindling supply (yay!) 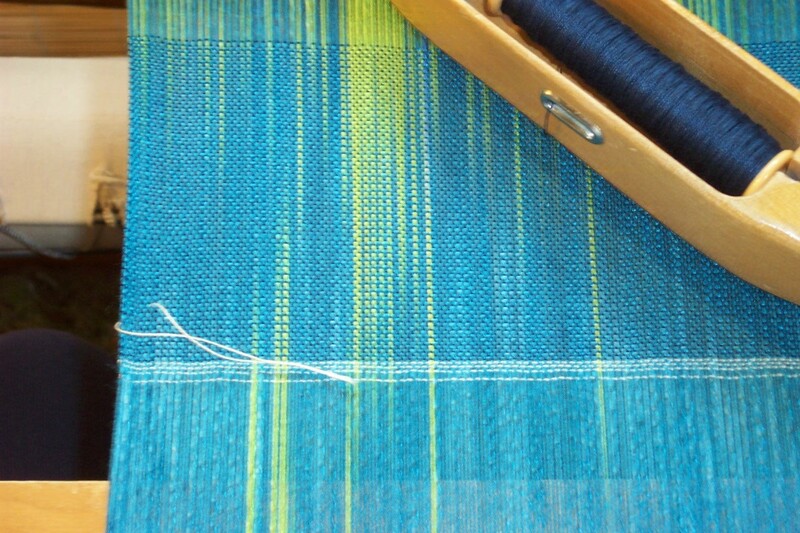 of 2/10 Tencel, some of it custom dyed, to select the weft for warp #11. This morning I started winding it onto bobbins directly from the skein and immediately noticed that it was much finer than I expected for 2/10. After winding the first bobbin off, I compared the yarn to the rest of the 2/10 and my suspicions were confirmed. It was much finer. Probably 2/20. Since I haven't ever ordered 2/20 dyed Tencel I can only assume the dyer got some skeins of the finer stuff and then, like me, didn't realize it. I stopped and thought about it for a split second, then decided to go ahead and use it up. 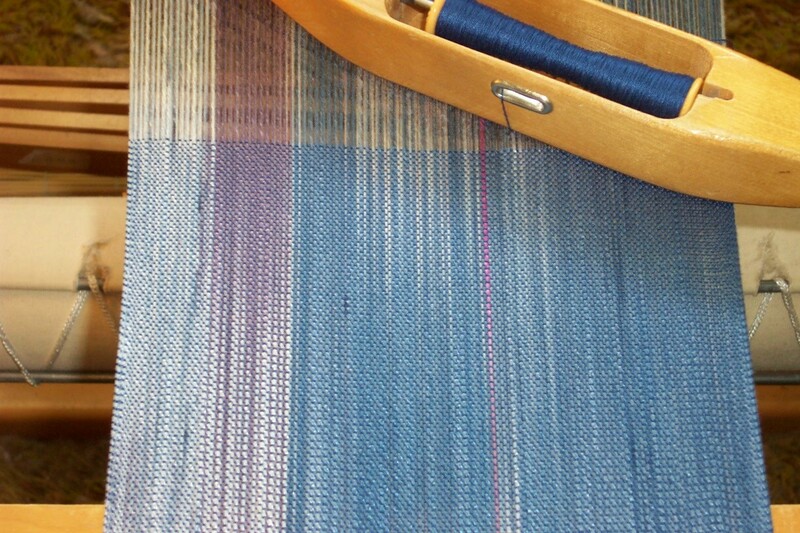 The colour is 'right' for this warp and the next two - if the yarn lasts that long. I'm low on Bambu 12. I paid good money for the yarn (it *is* custom dyed, after all) and the fineness of the yarn means that scarves woven with this yarn will be more in keeping in terms of hand with those woven with the Bambu 12, which is approximately a 2/16 grist. While I didn't anticipate that this run of scarves would wind up such an effective stash buster, why look a gift horse in the mouth? I know that things change. Mostly I embrace change because it usually means I'm doing something new and interesting. OTOH, sometimes things change way too fast! Yesterday I moaned that I was running low on weft inventory and I needed to place an order with Silk City for the Bambu 12. I was completely out of Kelp, and getting dangerously low on some of the other colours I wanted to use as weft. I immediately swung Plan B into action so that I would not have any 'down' time and started using up the last dribs and drabs of the dyed 2/10 Tencel in my stash. Not an ideal situation, but better than not being able to weave the scarves at all. Well, the bad news is that Kelp has been discontinued. So has Sugar Plum. Generally when suppliers, especially wholesalers, start discontinuing colours in a line it means that that particular yarn is probably on it's way out. Which is really annoying because I didn't even get this new design properly into production and now I'm going to have to (probably) switch gears and start sampling for a new weft, all over again. So if anyone has any Bambu 12 in Kelp they would like to move on out of their stash, I would probably buy it? If you are going to be at ANWG or NEWS, I could maybe pick it up from you and save the shipping....or if you have some 2/10 Tencel in nice dark values....? I knew I was beginning to run out of colours of the Bambu 12, but I had not realized just how low my inventory had gotten until I got to this warp (#10). Fortunately I had more of the custom dyed 2/10 Tencel in the semi-solids, one of which was a very dark green with lots of blue in it. After rummaging through the stash and adding up exactly what I did and did not have, I realized that I must urgently (as in today!) place an order for more Bambu 12. In the meantime I've dug out all the 2/10 Tencel that is left and will try to choose warps on which those yarns will work as weft. I can't afford to not be weaving, even though my pace will be somewhat slower as I continue to tackle the text for AGY:L&H. It's not a bad thing, this having to improvise on the planned colour ways. It forces me to try colours I might not have tried if there had been something more obviously good for weft close to hand. It forces me to take small creative risks. Even if the results are not to my tastes (as some of them have not been, in the past) it is quite amazing because almost always someone will come along and fall madly in love with the very thing that I think is a 'failure'. I love when things are going smoothly and all that is required is surface attention. 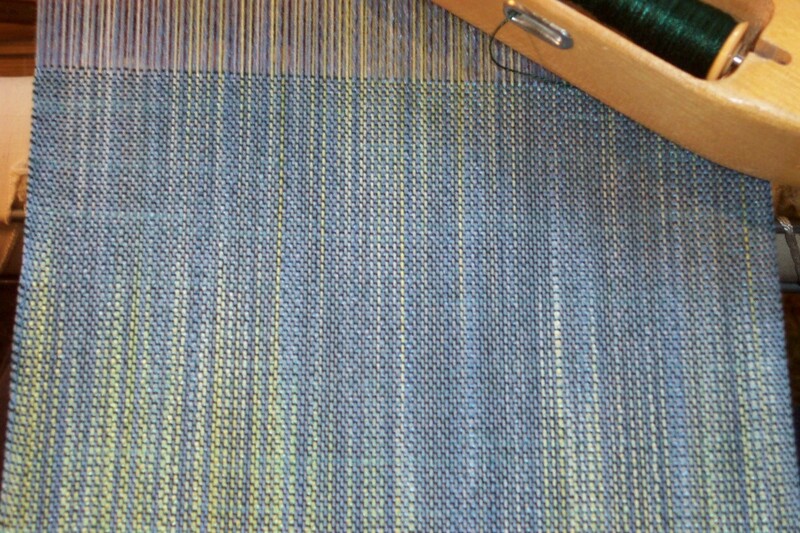 I can either go into my 'zone' and use weaving as a working meditation, or I can use the time to think about writing projects. And so it was this morning that I figured I could use the time spent weaving scarf #35 for getting my thoughts in order for AGY:L&H. Unfortunately with not one, not two, but three major research/writing projects all clamouring for attention, I found my thoughts bouncing from one to the other as a thought regarding project 1 sparked a thought relevant to project 3 which sparked a thought relevant to project 2 which reminded me I wanted to include this or than in project 3 and where was I? Pretty soon my thoughts were in a tangled skein (pun most definitely intended)! It very quickly became apparent that the best use of my time was to simply go into my 'zone' and finish weaving the scarf and then get to the computer with my notes and resources and get writing! So, lunch, then hair cut and then...write? Or weave? So torn!